20", 32 1/2", 53" x 36" engine by Atlantic Engine Works, Boston, MA, 1200hp, also noted as Fore & Aft, 505hp. Water tube boiler by Babcock & Wilcox. Burned for her scrap metal. 1876, Oct 3 Commissioned at Boston Navy Yard. 1877 Cruised to Liberia & West Coast of Africa. 1881 Went to Pacific Station. 1883 Went to Asiatic Station. 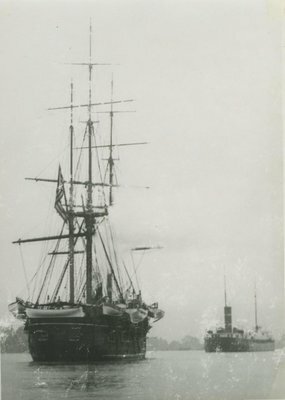 1893 Back in commission as a training ship. 1904 - 16 Loaned to Ohio Naval Militia, stationed at Toledo. 1917 - 26 Served Ninth Naval District, Duluth, MN; rebuilt in early 1920's, housed in & used for barracks, machinery removed. 1927, Oct 20 Loaned to Minnesota Naval Reserve. 1927, Oct 27 Off Naval register. 1930, Dec 23 Sold, dismantled at Duluth, hull beached. 1931, Oct Hull burned for the scrap metal.